I realize that it would have been helpful for Celiacs caught in Hurricane Sandy, myself being one of them, to perhaps have read this blog prior to the actual hurricane and all the devastation that's been left in its wake, however, that would have required the electricity still being turned on! And as millions of us know, we've been without power for quite some time...and millions are still without. Here in Portsmouth, Rhode Island (just a few miles inland from Newport), we were lucky enough to have the lights back on this evening - a small miracle given the scale of this monstrous and damaging storm. In the days leading up to this huge storm, it was truly hard to know which direction it was heading and which states/areas would truly be effected by its wrath. Having just arrived in Rhode Island this past Thursday night to visit family, we still weren't sure if this part of New England would be hit, so for the first 36 hours we were taking things with a grain of salt. As Sandy continued on her northbound path we started making lists of what non-perishable food and supplies we might need in the event the situation turned dire, or we were out of power for three-plus days. It all seemed rather straightforward until I was starkly reminded (duh!) that I'm the only Celiac in the family - out of seven family members, I'm it! That means I can't eat boxed whatever or survive on cold Spaghetti-O's or any of the other 'typical' unhealthy products that tend to rule when the elimination of stoves, refrigerators, and the use of kitchen supplies goes out the window. And being in this more rural, small city I was so relieved to remember that the Green Grocer, a delightful little market loaded with gluten-free products just down the road, would be my saving grace...and it has been! I seriously thought about what I could safely eat after a few days when all perishable items have passed their prime and I'm left with only gluten-free products that can't expire, but would still offer some kind of nutritional value - - not so easy but here's the list I put together and supplies I've had on hand all week and still snacking on tonight as the rain is steadily falling. Fortunately, our situation did not turn dire...scary, yes and a very long night of super-high winds and pelting rain with the fear of trees falling on to my brother's home, but thankfully we were spared from any rising flood waters or other severe dangers. The idea at this point is to be prepared, knowing that you can never be sure what life's going to throw at you or where you might find yourself -- be it a natural disaster or (as I can also thoroughly attest to) days of unexpected travel delays on foreign soil with nothing more than Larabars to sustain you! First priority - Tons of bottled water!! - Buy as many fruits as you know you can consume within a 72 hour period that don't require that much (if any) refrigeration: Bananas, apples, oranges, raspberries, blueberries. - Same (obvious) rule applies for veggies and chopping and bagging will also make them more manageable: carrots, cucumber (slices), zucchini, broccoli, cauliflower. Nutritional Bars: These little beauties can sustain me for days, assuming that I'm also drinking a lot of water to stay hydrated, while adding in some fresh fruit and bits of additional protein. Granola: This is always a staple - can serve as breakfast, lunch or dinner or a great snack. I use almond milk with my granolas, which can be left un-refridgerated for several days without issue. - I always keep bags of assorted fresh almonds, cashews, pecans, and pistachios loaded with dried cranberries, blueberries, apples, peaches, name your favorite and mix. They can maintain their freshness for weeks and provide a body with a good amount of fiber, omega 3's and protein. Chips, salsas and hummus: Though hummus is usually refrigerated, it can be left out for a day or two and remain edible and fresh. 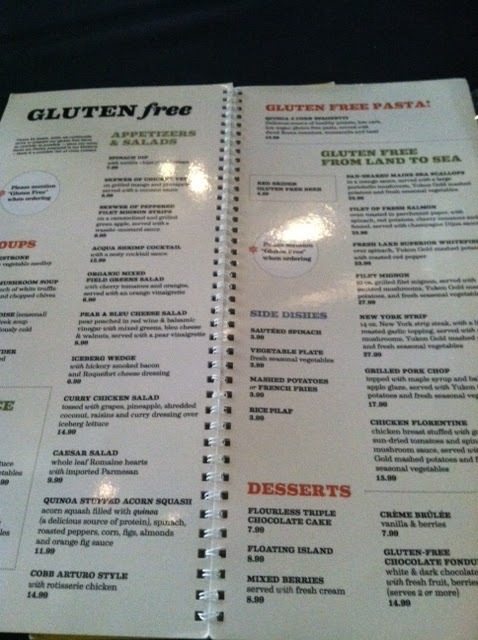 I've been reminded once again that living a 100% gluten-free existence is a challenge. But never has it been more true than this week finding myself in the middle of my first full-fleged hurricane, with the fear of being dependent solely upon my own thorough preparedness. Though I didn't have to go for days on end without power or clean water, my gluten-free supplies I stocked up on were indeed good choices, and I felt secure knowing I could sustain all week, eating safely without any cross-contamination from the other six family members' crumbs! I hope this blog and list will serve as helpful in the future for you in the event it's needed. My thoughts and prayers are with all of our fellow countrymen here on the east coast who are in the midst of such peril and facing unbelievable challenges that lie ahead. Sandy, please go away now! I love Risotto, like a lot! Whenever I've spent time in Italy this dish, in its many varieties, has always been my 'safe' and staple meal that's always gluten-free and delicious. I mean if you can't eat amazing risotto in Italia, then where on earth can you eat it, right?! As summer's end slowly transitioned into a gorgeous fall out here in the west, the crisp and cooler mornings give way to warm, auburn-lit afternoons, that in turn melt into cool nights. This barometric transition seems to have a distinct effect on my taste buds causing them to long for warmer dishes, giving salads a deserved respite. So when my mom passed along this simple and colorful risotto recipe loaded with the colors of fall, I was very happy to oblige and bust out the saucepans and olive oil. The beauty of this risotto is in the simplicity of ingredients and the fact that it's not ladened with creams or butter...okay, it only calls for 1tbsp of butter, but it's optional. The other treat that comes from cooking this dish is that it also calls for a 1/4 of white wine (not optionl! ), which means that since you are required to open the bottle for cooking sake, it's almost a sin not to pour yourself a glass while actually cooking - are you following me here?...and who doesn't enjoy cooking and drinking, I mean really. Now that there are some decent and semi-tasty gluten-free breads on the market, it's easy to accompany this dish with a simple yet perfect, bruschetta. Easy to make and just the right amount of crunch and flavor to accompany this heartier dish. In a saucepan heat and keep warm 4 3/4 cups gluten-free, low sodium (organic) chicken broth. In another larger saucepan heat 1 tbsp of good Italian or Portuguese olive oil over medium heat. Add 1 small minced shallot, 1 1/2 cups arborio rice and 1/4 cup white wine and cook, stirring, about 1 minute. Stir in 1 cup warm broth; cook, stirring, until almost all liquid has been absorbed. Repeat until all broth has been added. With the last addition of broth stir in 10 oz of halved cherry tomatoes; cook, stirring, until thick and creamy, about 6-8 min. Stir in 1 tbsp butter (optional), 1/2 tsp sea salt and 2/3 cup of shredded fresh Parmigiano Regianno; serve immediately. 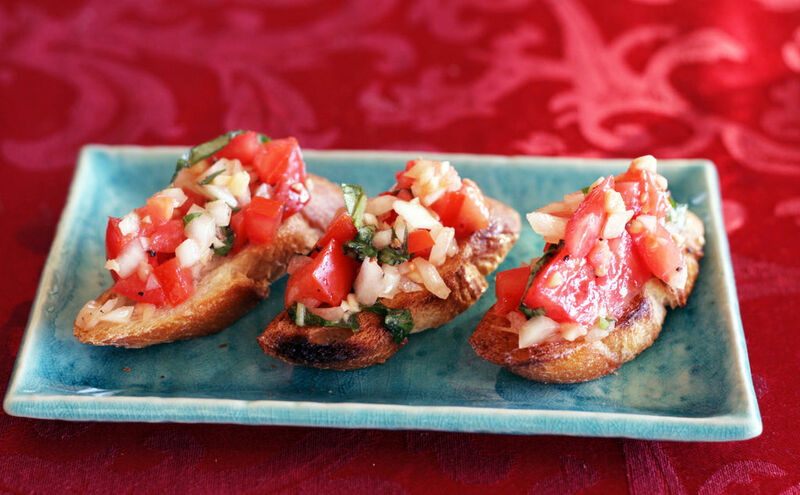 Bruschetta is made up of very simple flavors, and is, therefore, best if you make it with the highest quality and freshest ingredients you can find, but that's always the case when cooking! Using a sharp knife, dice the tomatoes as small as you can. I try to aim for 1/4" cubes and try to mush or break the tomatoes as little as possible. *If you're opposed to using raw onions, you can also lightly sauté the chopped onion in a frying pan with a little bit of olive oil, garlic, salt and pepper - that's what I do. It adds a sweeter deeper flavor to the bruschetta, and is an excellent variation to this recipe. Next, chop the fresh garlic and add it onto the growing pile of deliciousness. Add in some fresh basil to taste. I used 3-4 large leaves, but there's no "right" amount. Add in the (good) extra virgin olive oil, sea salt, and fresh ground pepper and mix the ingredients thoroughly. *If you've got the time, let the mixture setup for 30 minutes in the refrigerator, if you don't it's also delicious when eaten immediately. It's best to time it around the risotto and prepare ahead. Depending upon what type of GF bread you've chosen, determines what size you slice the pieces...if it's Udi's or Rudi's, I suggest 'halving' the slices. A proper bruschetta would use real hot coals to toast the bread, but it's perfectly understandable if don't have access to a slow burning fire moments before serving dinner - you need to be in Italy for that! Toast the bread in a toaster, or under the broiler if you've got a big batch. Once the bread is good and toasted, remove it from the oven and use a pastry brush to paint each slice of bread with olive oil. Finally, pile as much of the bruschetta as possible onto the freshly toasted bread, serve, and enjoy! Rarely do I choose to use the word "perfect" when I write or speak, as it conjures up so many illusions of unattainable circumstances or outcomes...however, when it comes to using this word in reference to the gifts and works created by Mother Nature, it feels quite substantiated! Today is one of those fall days which makes you beg, wish, pray, hope for duplication. The light has changed and the stillness of tree branches has arrived. It's a brief respite before fall begins to slip into winter, bringing cold gusts of wind and darkness...so capturing the exquisite "light" that's ascended upon us all for these precious few remaining weeks is a gift. 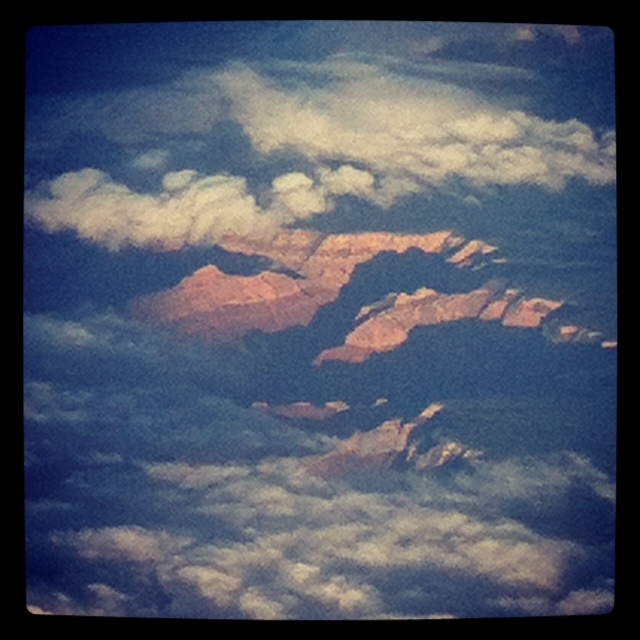 The Grand Canyon is in view. I sat on the correct side of the plane this particular evening, grateful for the vista of such a work of art, personalized by Mother Nature, herself. What does it say about one's spirit or true character if they are to admit that some of their most enlightened and/or awe-inspired moments happen for them (okay, me) at 35,000 + feet above the earth? I'm lucky enough on this particular flight to be writing this post from the more comfortable front section of this flying vessel, a place called business class. Yes, I am drinking a cup of Chardonnay that's enlighten my mood a bit, on the tails of having to say goodbye to all whom I love the most this afternoon in So. California. 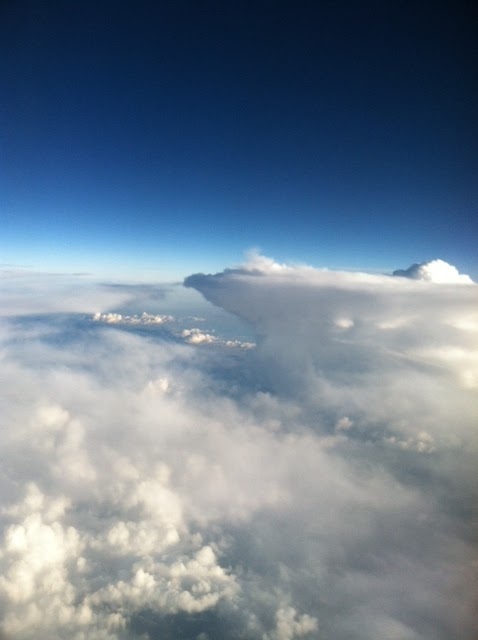 As we speed past some of the most gorgeous cloud formations I've seen in a very long time I'm in congruence with the understanding of why a legend, such as Hemingway, experienced elations and inspiration in his writing endeavors via the tool and use of various forms of alcohol! At 35,000 feet, one simple glass of wine turns my own writer's brain on hi-speed...creating feelings of grandeur and effervescence for written words. Simple forms of beauty, such as thunderclouds and a view of the awe-inspiring Grand Canyon, remind me of our planet's magnificence and splendor! A big jolt shakes me back into the present moment where I'm reminded, once again, soaring alone on this vessel through the sky, how thoroughly at peace I feel in these fleeting moments of joy. The simple pleasures of a window seat. A temporary "high" created by the likes of God, Mother Nature and yes...that cheap glass of Chardonnay. * On a gluten-free side note, I wanted to mention a great restaurant, LuLu California Bistro, located in the heart of downtown Palm Springs, CA. 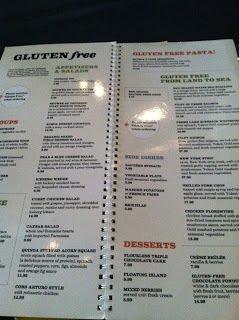 We discovered this eatery on the way to the airport, realizing they offered a full gluten-free menu! The atmosphere is a mix of hip and retro, offering more glamorous dining inside, and a huge outside patio (with mist-ers for those roasting Desert days). The food was very good and I indulged in a bowl of GF pasta - such a treat. Everything in their kitchen is separated to ensure no cross-contamination and the wait staff is knowledgeable. The menu offerings are abundant and it's a restaurant I'll definitely visit again. Be sure to check out LuLu California Bistro the next time you find yourself in the Palm Springs area.